Always use your US Womens Size to place your order. 1. Dress shoes sold by chain stores usually have accurate US Womens sizing. Please try different brands and models to confirm your size. 2. UK sizes and European sizes are sometimes improperly labelled. If you use UK or European sizes, make sure they always convert to the same US Womens size. If you find major discrepancies, visit a local shoe store to verify your size. 3. If you use US Mens sizes, make sure your dress shoe and running shoe sizes are the same. You can then convert it to US Womens size. 4. If you do not have many shoes, it is best to visit your local shoe store to verify your US Womens size. 5. Foot length is a guideline to your size. It is difficult to accurately measure your foot length by yourself, so it will be better if someone helps you. Example: If your foot length is between 27.0cm and 27.4cm, the majority of your shoes should be US Womens 12. This corresponds to the "Foot Length 27.0cm" row in the chart below. 6. When in doubt, always use your US Womens size to order. It is imperative that you use US Womens Size for reference. UK and EU Sizes exhibit various discrepancies. You may also e-mail us for assistance. 7. You do not need to add a width increase if you normally do not require it. Width increase makes the toe box feel better. However, if you don't need it but still ask for a width increase, the resulting increase in volume raises the size of the shoes. Always prepare a shoe insert just in case you want to reduce the volume of the toe box. 8. If the heel of you feet are narrow and always slip out of the heel counter of the shoes, we cannot make shoes to fit you. You need to purchase full or half size inserts and heel counter gels to make the shoes fit. 9. All of our shoes run true to size. The width option is based on your foot circumference measurement around the ball of your foot. This is noted as "Toe Base" on the foot and leg measurement chart. Standard Width (B): If you wear regular width shoes, please order Standard Width. Single Width Increase (C): This adds a Half Size. If you wear wider width shoes, choose this option. Double Width Increase (D): This adds a Full Size. If you wear extra wide shoes, choose this option. The width increase creates more toe room. If you like your shoes to be slightly wider (half size bigger), choose Single Width Increase. Shoes stretch over time. If the shoes become too big, place a padding or insert at the toe base of the shoes. Special Note: All of the platforms indicated above are HORIZONTAL visible or hidden platforms. SLANTED platform is only available by request and for shoes that can be made with a slanted platform. Size Note: If you order a pair of single sole shoes, sandals, or boots (without platform), and your size is China Size 38 or smaller, you may request for a 1cm horizontal hidden platform. By adding this platform, there is less reduction in heel height. The toe box will look slightly bulkier, but not very noticeable. This platform fee is $30. Please e-mail us if you wish to add this option. In this chart, all shoes do not have platforms. For platform designs, please view abbreviated table below. Many customers wish to know the actual heel height for their size. The chart below indicates approximately what the actual heel height is for a certain size. For this heel height and platform combination, only 14cm metallic heels can be used. The heel height is 14cm for all sizes. Actual lift of the shoes is approximately 12cm and varies according to size. The heel height is 15.5cm for sizes up to and including China Size 41. The heel height is 16cm for larger sizes. Actual lift of the shoes is categorized under C14 in the chart above. For this heel height and platform combination, only 18cm metallic heels can be used. The heel height is 18cm for all sizes. Actual lift of the shoes is categorized under C16 in the chart above. For this heel height and platform combination, only 18cm metallic heels can be used. The heel height is 18cm for all sizes. Actual lift of the shoes is categorized under C14 in the chart above. The heel height is 19.5cm for regular heels, 20cm for metallic heels. Actual lift of the shoes is categorized under C16 in the chart above. The heel height is 19.5cm for regular heels, 20cm for metallic heels. Actual lift of the shoes is categorized under C14 in the chart above. The measurements for both your left and right feet and legs are required. Please indicate LEFT LEG and RIGHT LEG when you send us the measurements. 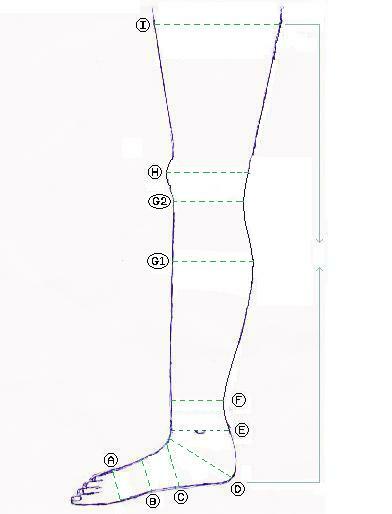 Please use the following chart when custom making knee high boots and thigh high boots. When making measurements, stand straight with your feet flat on the ground. Use a metric (cm/mm units) soft ruler to take measurements. Don't make the soft ruler too tight or too loose. You may also use a thread to take the measurements, mark the thread, then measure the marked length. Please repeat your measurements to ensure accuracy. A - Toe Base: This is the circumference measurement of the ball of your foot from the base of your thumb bone to the base of your pinky bone. The base of the thumb bone is located ahead of the base of the pinky bone. Please make sure you line up your soft ruler correctly. B - Arch: This is the circumference measurement of the center of your foot. C - Peak: This is the circumference measurement of the highest part of your foot. The soft ruler should be placed between the Center and the Heel of your foot, right under the highest part of your foot. D: This is the circumference measurement from the highest part of your foot to your heel. E - Ankle: This is the circumference measurement of your ankle. F - Above Ankle Measurement Set: The first measurement is the circumference measurement of the position slightly above your ankles. This position is the thinnest part of your lower leg. The second measurement is the height of this position measured from the ground. G1 - Calf Measurement Set: The first measurement is the circumference measurement of the widest part of your calf (lower leg). The second measurement is the height of this position measured from the ground. G2 - Under Knee Measurement Set: The first measurement is the circumference measurement above your calf, below your knee. This is the lower flex point that is thinner than the widest point of your calf. The second measurement is the height of this position measured from the ground. H - Knee Measurement Set: The first measurement is the circumference measurement of your knee. The second measurement is the height of this position measured from the ground. I - Thigh Measurement Set: When you order custom made thigh boots, you must indicate where your thigh boots end. The "Thigh Measurement Set" measures this end position. The first measurement is the circumference measurement of your thigh. The second measurement is the height of this position measured from the ground.